We offer Private Limousine Service throughout the High Country and beyond! 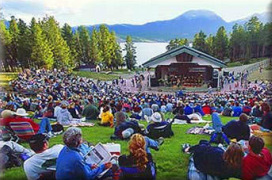 Concerts, Sporting Events, Wine in the Pines, Dancing with the Stars, etc. Be it from Breckenridge to Frisco, Silverthorne to Copper, or even round-trip service between Vail and Denver, we have you covered. Bachelor and/or Bachelorette parties are our among our specialties! We love providing safe and reliable transportation to Rockies games at Coors Field, and Avalanche games the Pepsi Center! All services are completely custom. Every limo ride is completely private, no shared vehicles! Our Favourite Venue is Red Rocks Amphitheater! We offer rides to and from Summit County and beyond for events such as concerts at Red Rocks Amphitheater, Breckenridge's Springs Fever, Vail's Hot Summer Nights, or even a Rockies, Broncos, or Avalanche game. We'll even reduce the cost if you provide a ticket for your driver! Next time you want to go to an event and not worry about who's going to drive, Call Jake. We'll get you there safely and stylishly! View from The Stage at Red Rocks Amphitheater!